Also known as PK 204.1+4.7, Kohoutek 2-2 is a large, faint planetary nebula in the constellation of Monoceros. It is probably an old planetary nebula and appears embedded within a complex of even fainter nebulosity. Whether this is part of the original star’s red giant envelope or is something unrelated is unknown to me. According to The Simbad database, the planetary nebula has a diameter of 6.9’ and a distance of 2816 light years. There doesn’t appear to be much more information than that available about this particular planetary nebula. This image was taken over several nights between the beginning of February 2019 and mid-March 2019. 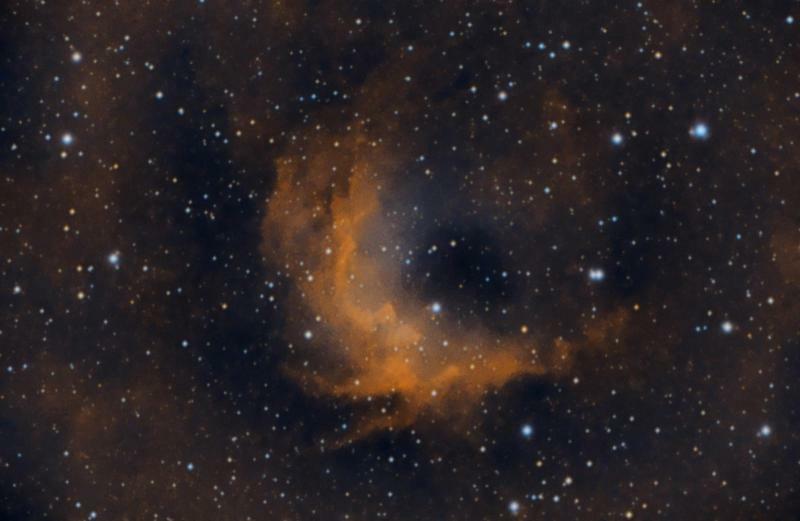 The equipment used was a Celestron Edge HD11 telescope with Celestron f7 focal reducer, QSI6120 CCD camera (cooled to -25 C) and Astrodon 3nm Ha and O3 filters. The scope was guided with an ONAG and Ultrastar guide camera. The mount was a Mesu 200. The exposures were: 32x900s, binned 2x2, through the Ha filter and 32x900s, binned 2x2, through the O3 filter, giving a total of 16 hours. The image scale is 0.67” per pixel. After stacking the images in PixInsight I then separated the stars and nebula and processed them separately, before recombining to get the final colour image. I would have liked to replace the NB stars with RGB stars but ran out of time. For both stars and nebula the red channel is 100% Ha, the green channel is 50% Ha, 50% O3 and the blue channel is 100% O3. Thanks for looking and I hope you like it. Beautiful. You rarely see that color in astrophotos. Did you choose that intentionally? Thanks for sharing, nice to see an object I've never heard of before. Keep imaging the obscure! Thanks Dave. It is an intentional choice. I’m not keen on the colours that come out of HOO combination, although that may be down to me being unable to tweak them into what I think is a nice picture. I quite like these colours so I try and stick with them. thanks for posting this off-the-beaten-path object. Love it! Thanks so much for sharing this wonderful result.